It is a tool to convert OST to MBOX file format in a convenient way. Since the MBOX files are supported by numerous email applications like Thunderbird, Apple Mail, Sea monkey, etc. This tool transfer OST emails into MBOX. Some of its noticeable features are listed below. 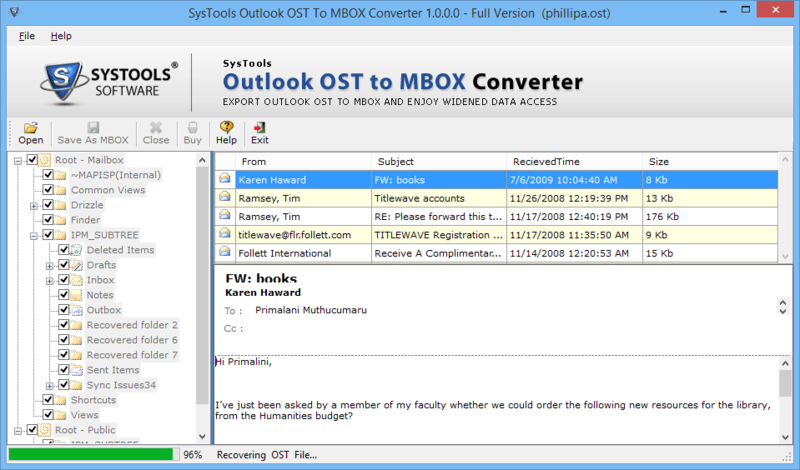 The unique software helps one to migrate multiple OST Emails to MBOX file format. Along with this, it keeps attachments embedded in OST emails. It converts entire .ost file items to .mbox including the data from inbox, drafts, outbox, sent items, and so on, by maintaining original formatting and folder hierarchy. Before migrating from OST to MBOX, a quick scan is performed on all email files to re-index data even if some files are corrupt. All the files are first scanned and then are listed in the original folder form. After this, the tool automatically saves the scanned results. Users can perform selective migration by checking/ unchecking the items according to their needs in this tool. By default, it converts all the OST files and folders. 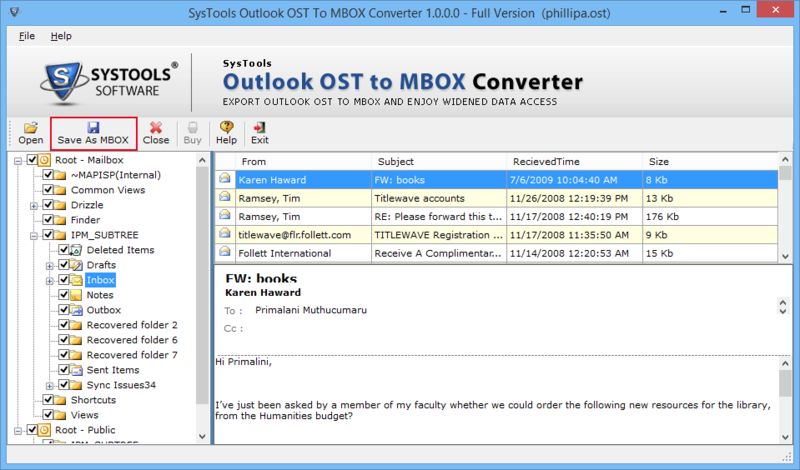 The tool generates a MBOX file for each file having emails e.g. inbox.mbox, drafts .mbox and much more. After the user clicks on the button to export OST to MBOX, the tool asks user to specify a file saving location on the system. User can choose any desired location or else can create a new folder to save the MBOX files. 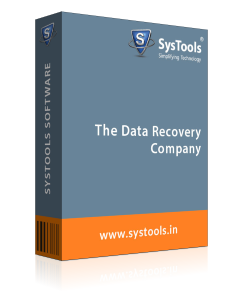 After the file location is specified, the software will start the OST migration Process. Applications like Thunderbird, Entourage, Apple Mail, Mac Mail, Eudora, Sea monkey etc. Each of these clients allow user to import MBOX files form external source. Thus, after moving .ost files to MBOX, user can easily access and open even orphan OST files.
. 1. Can I export .ost files to MBOX format by this tool on a Windows 10 system? Q. 2. Will this tool retain the metadata properties of emails? Q. 3. 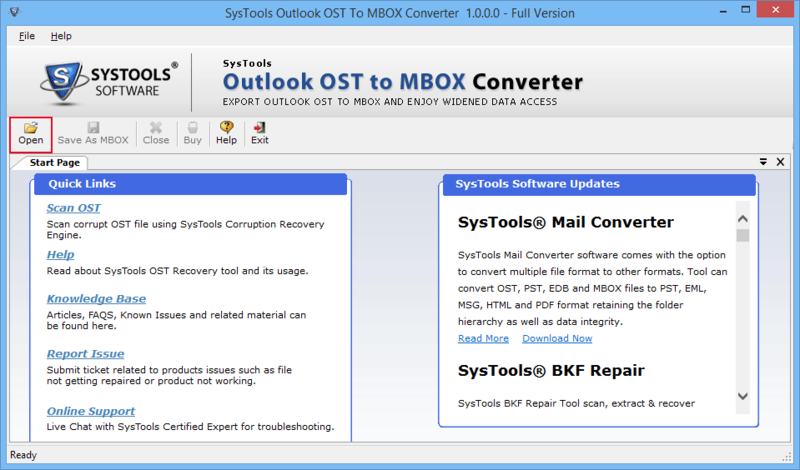 While performing Conversion of Outlook files to MBOX, will this tool convert orphan OST files to MBOX format? 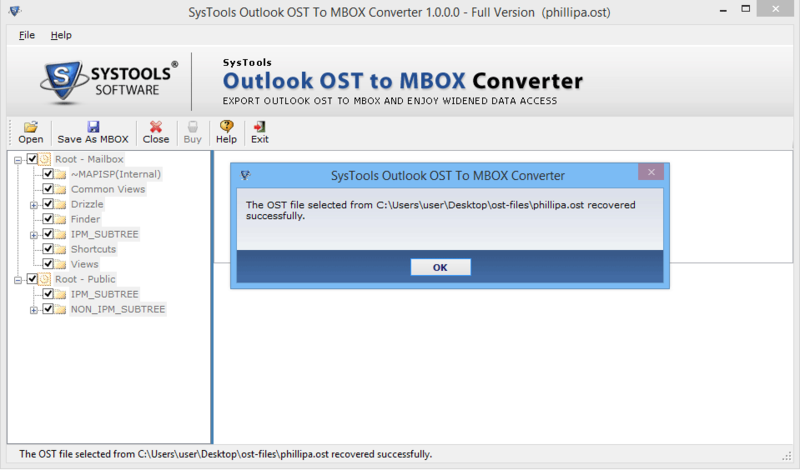 Yes, the tool can easily scan and convert the orphan OST file as MBOX while exporting OST files into MBOX format. Q. 4. Does the software is support MBOX file of every email application? Yes, our OST to Multiple Email Client converter tool is designed in such a way that it support MBOX files, associated with any email clients such as Thunderbird, Apple Mail, Entourage, Mac Mail, Sea monkey, Eudora, etc. 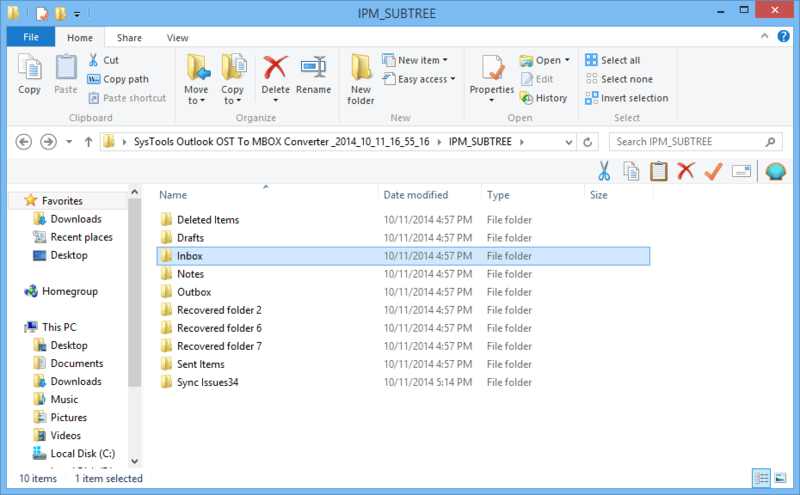 How to Convert OST File to MBOX format? 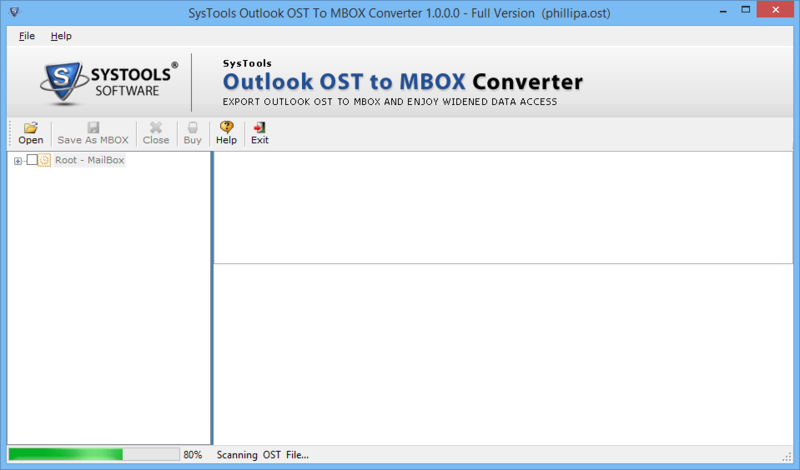 Step 1 : Go to ‘Start’, then ‘All Programs’ and click on the Outlook OST to MBOX Software. Step 2 : A window will appear on the screen in which click on ‘Open’ option at the top left. 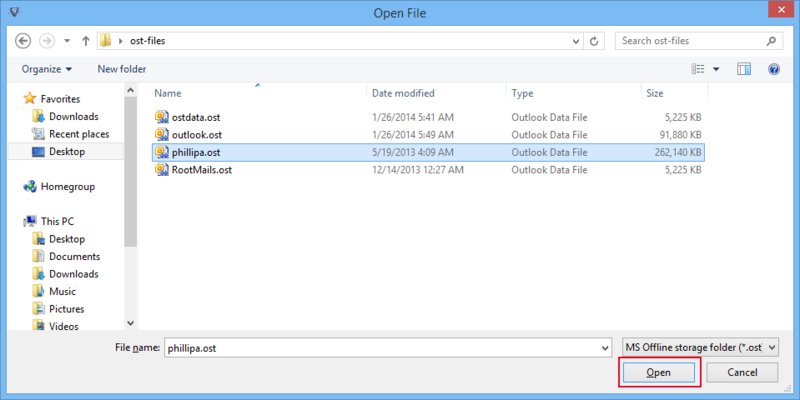 Step 3 : Browse and select the OST files that are to be converted and click ‘Open’ option. Step 4 : Once the OST files are loaded, live scanning starts in front of the user screen. Step 5 : A completion message appears after the successful and click ‘OK’. Step 6 : Now, all items are displayed on the left panel and double-click to read it in the right panel. Step 8 : Select the destination folder to save MBOX files at desired location and click OK. 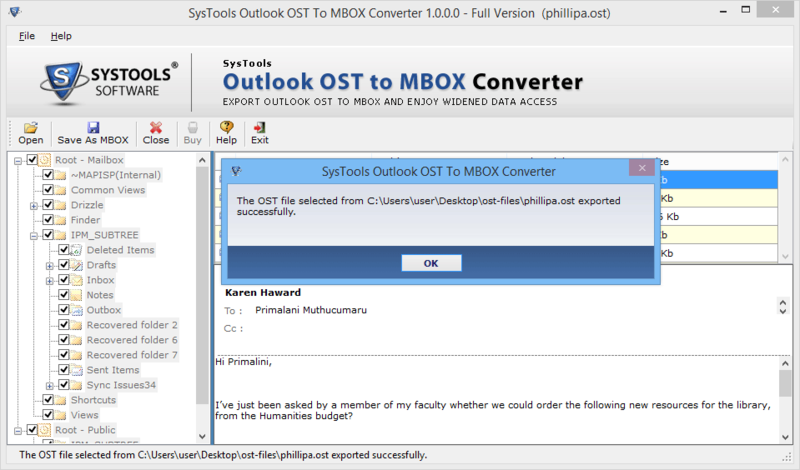 Step 9 : After successful export of files, a message will be displayed then, click on OK button. 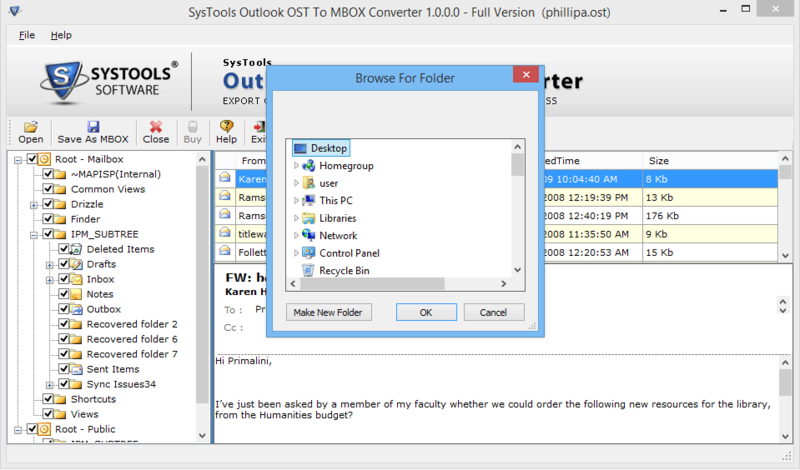 Step 10 : Finally, the user can navigate to the saved location for viewing converted Outlook to MBOX files. Step 11 : Now, You can easily import the converted MBOX file in Thunderbird, Apple Mail, Entourage, Mac Mail, Sea monkey, Eudora, etc. I urgently needed to migrate OST files to MBOX for my office purpose but I was terribly stuck in the migration process. Thanks to your tool that smoothly convert OST to MBOX, conversion has become so much simpler for even a non-technical user like me. Hats off to the developers for providing such an efficient software and tons of thanks to your team! Although the interface of the OST to thunderbird(MBOX) Migration tool is quite simple, yet I got confused with some steps. So, I contacted the Support team which proved to be completely fruitful. They helped me with each step and its because of them I could finish the migration without any issue. All in all it is a great software.